Finding a sporty and highly affordable new car near Bloomington, IN is simple when you shop at Community Mitsubishi of Bloomington. As Bloomington's Mitsubishi new car dealership, we carry Mitsubishi's complete lineup of new cars and crossovers in a range of trims, colors and options. Your new Mitsubishi in Bloomington awaits; find it today by browsing our online inventory or visiting our Bloomington, IN dealership. Here at Community Mitsubishi of Bloomington, our Mitsubishi sales associates are committed to assisting local car shoppers to find the ideal new vehicle for their lifestyle and budget. It certainly helps that every new Mitsubishi is affordably priced and comes packed with the modern amenities that every driver and family wants. If you would like some assistance in your car search, either with narrowing down your options or getting behind the wheel of different Mitsubishi models or trim levels for test drives, that is what our sales specialists are here for! All of the latest Mitsubishi models are here, in-stock at your Bloomington, IN area Mitsubishi dealer! Shop online or on-site today to discover our selection of new Mitsubishi vehicles for sale like the Outlander, Outlander Sport and new Eclipse Cross. Explore and compare the latest Mitsubishi crossovers here on our website, then visit us for an informative tour and test drive. 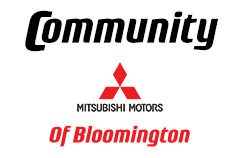 Community Mitsubishi of Bloomington not only provides Bloomington, IN area drivers with affordable new Mitsubishi cars, but we also carry a selection of quality used cars and Certified Pre-Owned (CPO) Mitsubishi vehicles. See our used car specials today; you could save even more on a low-priced pre-owned vehicle at Community Mitsubishi of Bloomington! If you are purchasing a new Mitsubishi or used car at Community Mitsubishi of Bloomington, then you are probably thinking about financing. First, submit a secure online credit application to get pre-approved; then, our team of finance professionals will work to find you a great rate on your auto loan. We assist car shoppers of all credit levels and financial situations, so whether you have no credit, bad credit, good credit, or perfect credit, choose Community Mitsubishi of Bloomington for auto financing! Our service center and parts department are here on-site for local drivers seeking expert auto service or genuine Mitsubishi auto parts and accessories. From brake jobs, warranty repairs, and tire replacement to oil changes, software updates, and major powertrain repairs, our team of service technicians can handle it all.